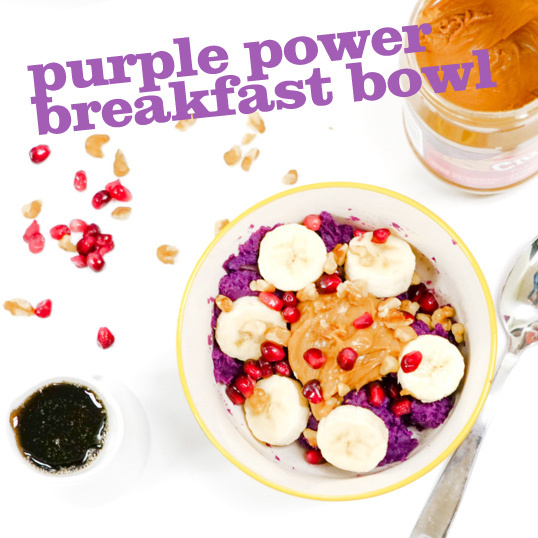 Roast a few Stokes Purple® sweet potatoes on the weekend, and you’ll be ready to make a great nutritious breakfast on demand for the next few days! In bowl, whisk together peanut butter and maple syrup until smooth, then set aside. Peel baked purple sweet potatoes and chop into thick chunks. In another bowl, mash sweet potatoes until smooth or to your preferred consistency. In serving bowl, add mashed sweet potatoes. Spread peanut butter sauce on top, then layer on banana slices. Sprinkle with walnuts and pomegranate seeds. Drizzle with more maple syrup and add a pinch of cinnamon, if desired. * We recommend baking Stokes Purple® sweet potatoes wrapped in aluminum foil at 350 degrees for 1 1/2-2 hours. Keep them wrapped and let cool 1-2 hours, then put them in a zip-top bag and refrigerate overnight.